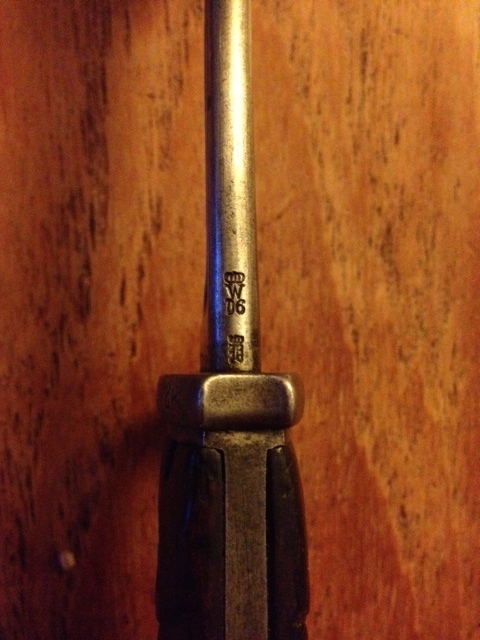 Here are a few s98 bayonets with unit markings which may be of interest. 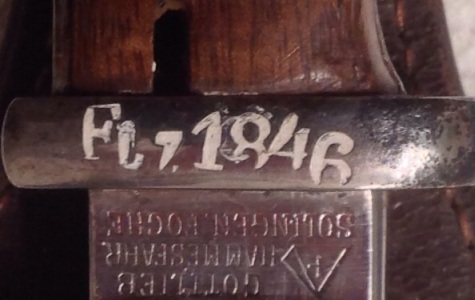 The ‘FLZ 1036’ mark is also not entirely resolved ... I am inclined to go with Flak Zug. SS - I think you have a copy of the German Army Organisation book? Want to check? Trajan, I know I have mentioned this once before, but since you are still "clutching at straws" with this one, I guess I will say it again just for the record ... this is not a GW period mark. You're probably too close to this one and too desperate to find a meaning for this marking to be able to look at it with a logical and reasoned approach - ask yourself does it look GW.? Just looking at the markings that have been posted to date on this thread, it is not difficult to find differences just in how the markings were stamped alone, without even looking at units. 1) How many Imperial markings are stamped so sloppily.? 2) How many markings do not feature a period/stop in the string.? 3) How many markings have such different sized letters.? And then looking at the units, there is nothing in the Imperial organisation during the GW that would fit in with this marking. If Z = zug, that unit will be smaller than a Kompagnie level. And while Flakzug (anti-aircraft units) were incorporated late in the war, these were made up of just a couple of guns to form a Batterie. These would never have used 1000's of waffe. This pic of a similarily marked example (purportedly from the same 'unit') which you posted previously. If this example is anything to go by, I wouldn't be surprised if they were spurious. 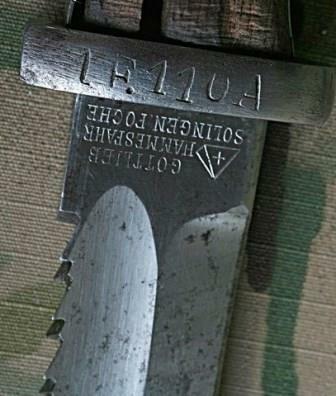 In this particular case, with this particular bayonet marking - my FLZ 1036 and the two known other examples - then I must stress something that would be obvious to most people who would have read my post with a clear objective mind. That my endeavor throughout has been to establish an identification for this marking, which is why I have searched here and elsewhere for assistance, and which is why I have given the alternative readings, and then given my interpretation of what it might be. 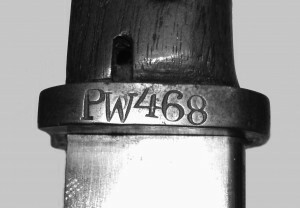 Having said that let me add that the FLZ mark is not the oddest or most inexplicable of “non-regulation” or “non-standard” markings that I have seen on bayonets or bayonet scabbards, and repeat that there are three examples of this mark, which is (according to my admittedly imperfect records) slightly more than what we have for a host of other units! 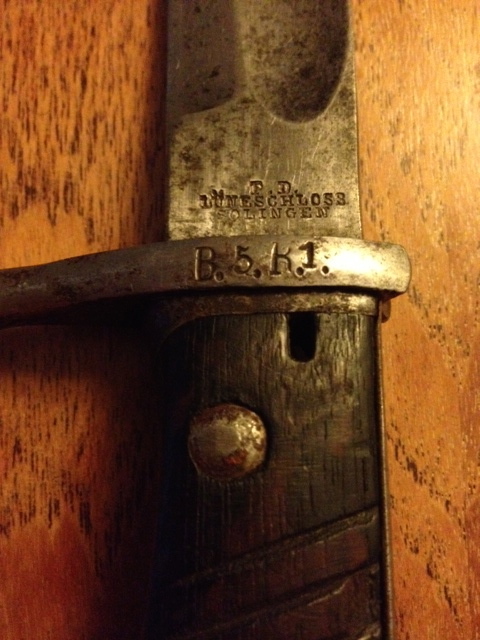 1) Both Roy Williams and Jeff Knoll, who have between them seen and studied many more WWI German bayonet (and other WWI German weaponry) marks than you or I or most others, have both listed the FLZ mark in their respective books. That is to say, they accept it as a genuine WW1 unit mark, with one of them favouring the Flak zug interpretation, with the implied meaning of a train-based flak unit, the other favouring it being a Flak zug training unit mark. But both of these authorities do accept it as a WW1 mark for such a unit. If you have anything to prove the contrary then please let them know – especially Jeff Knoll as he is thinking of issuing a revised edition of his work! In the meantime, if it is ok by them, well, it's ok by me! 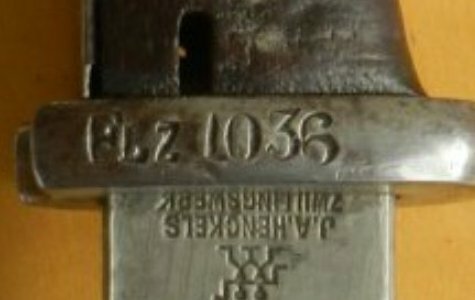 2) Fakers do not generally create marks for entirely spurious units... Now, if this was a rather odd style of mark representing an unusual unit – for example, a MGK unit or an Uhlan squadron, or even an airship platoon - then yes, I would be rather wary of its authenticity. But who outside of a limited number of WWI scholars has ever heard about these WWI Flak Trains? In other words, a very odd choice for a faker to make this mark for a perfectly legitimate bayonet - would you not agree? And if so, why on earth not go the whole hog and cross out the UV marks on the scabbard (another "odd" unit) and put a matching FLZ mark there? Or even better - make the marks on the bayonet the right blooming (onion) size? Maybe it is spurious... But if so, then why choose such an odd and unknown unit? 3) Please remember that all that I was (and am) offering in respect of this particular marking is my opinion and interpretation. I always try to make it clear what is my opinion on something, and what is the opinion of others. You are free to disagree with my opinions and those of others - but you do often seem to take contrary opinions on a rather personal basis! May I refer you back to http://1914-1918.invisionzone.com/forums/index.php?showtopic=146922&hl=post 19, where 4th Gordons observed about a reply of yours:- “I am really not sure how every time we are both involved in a thread it turns out like this but look....it seems to me...”. In other words, I am not alone in attracting heavy flak (ouch!) when contradicting you or differing on an opinion that you offer. But I and others are usually simply offering our opinions, although if and when necessary any of us will offer fact to correct you on a belief you wrongly hold to be true (as with my observations from the German regulations about ‘K’ marking on bayonets having a real meaning) -- as indeed you would do also! That is what scholarship is all about. 4) You do seem to have an absolute faith in your own ability to distinguish “period” from “non-period” markings, whether these are German bayonet unit marks or marks on other categories of edged weapons. But on the whole most of us are prepared to make allowances for differences in stamping - and also to accept honest opinions when they are offered, rather than responding in a rather top-heavy manner as you have done here! And which heavy-handed remarks, BTW, I raise no objection too, as as others have done on some of your responses, as scholarship involves debate. 5) By way of conclusion, I would respectfully suggest to you that a little more awareness of and, yes, research into, the variations in unit markings on WWI German bayonets might be of benefit. They do not always slavishly follow the 1909 regulations to the letter and the last dot as you believe! Just have a gander at these sloppy and irregular marks – accepted by some/most/all (delete as you wish) as real WWI markings (I can find many others) – or give me (and those who accept them as such) evidence to the contrary! More anon - and also comments re: the second example except/unless somebody replies beforehand! Yes, I must admit I'm not 100% sure on the scabbard markings myself, although have not researched these in detail yet. "Attacking formations consisted of the 2nd Kings Own Scottish Borders and 1/9th (Queen Victoria Rifles) and the 2nd Kings Own Yorkshire Light Infantry, there is a monument which stands proudly on the summit of the hill to this day. As the assaulting party closed on what was left of the German 172nd Regiment holding the hill, the dazed Germans screams could be heard over the battle dim, as the British tommies with fixed bayonets ploughed into them killing around 150, with I am told only 20 or so being taken prisoner. Total British casualties were less than 10." 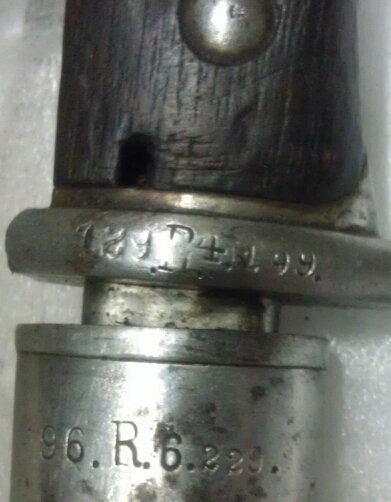 And whilst on the topic of Ieper and unit marked German bayonets, here is a 98/05 marked to the bavarian 5th regiment, which was defending the front line on Messines Ridge when the mines were exploded ahead of the 1917 attacks. I note that this exact unit marking appears a number of times in Roy Williams book (vol 1). 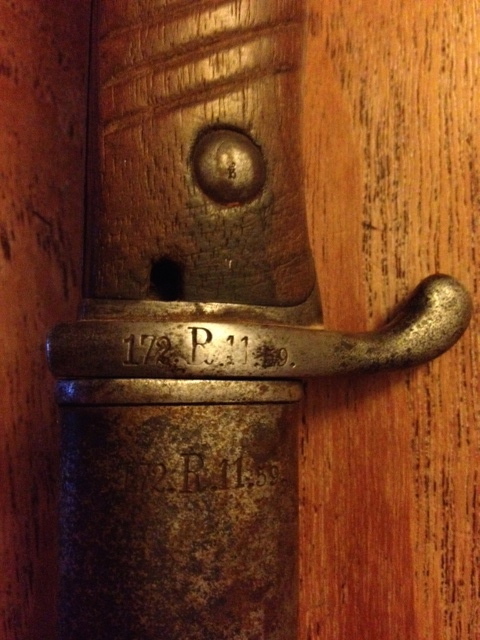 I have a feeling that that 'F' on the scabbard is a poorly impressed 'P'... And I think I might have an explanation a little later for what this is doing there but I need to research some more... The rest of the mark I think is straightforward - Grenadier-Regiment König Friedrich der Grosse (3. Ostpreußisches) Nr.4 - for which see http://genwiki.genealogy.net/Gren.R_4 Note how on this thread - http://1914-1918.invisionzone.com/forums/index.php?showtopic=208440 post 18, SS supplied the information that the letter ‘G’ did not feature in their stamping as this could cause confusion with a ‘Garde’ unit! And last but not least, the Kgl. Bayer. 5. Infanterie-Regiment Großherzog Ernst Ludwig von Hessen is to be found on http://genwiki.genealogy.net/KB_IR_5 and yes, it does seem to have left a lot of marked examples! and so I began to wonder if the Grenadier-Regiment König Friedrich der Grosse (3. Ostpreußisches) Nr.4 might have been a unit akin to the Grenadier-Regiment zu Pferd Freiherr von Derfflinger (Neumärkisches) Nr.3, a unit that seems to have a slight identity crisis as it also went by the name of the 3. Dragoner-Regiment and/or Dragoner-Regiment Nr.3. I wasn’t able to find any information about why that unit had such an identity crisis, but in any case, apart from the fact that after a long search, I found no evidence that the Grenadier-Regiment König Friedrich der Grosse (3. Ostpreußisches) Nr.4 was ever ‘zu pferde’, I would guess that if it had been, then the unit designation would be something like '4.R.P.2 and not 'P.4.R'. So, the search is not ended, but certainly postponed for now! In the end it could well be that a simple explanation is found... Inshallah! Well done that man! I was wondering when somebody would pick up on my suggestion that it was a "P"! I didn’t think I would have to develop the theme to finally get a positive reaction! And a Happy April 1st! Thanks both. So just to clarify, the "F" which we then thought was a "P" is actually a "B" and thus a reference to the 4th Bavarian regiment? Funny as I was just reading about that regiment, so that is a welcome discovery! 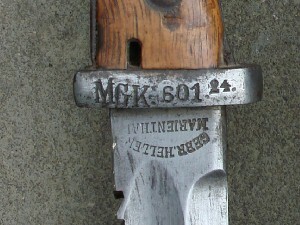 The scabbard is ‘1.E.M.G.K.7.A.K.36’, and so 1.Ersatz-Maschinengewehr-Kompanie, 7.Agrmee-korps, Waffe 35. All I have on them as yet is that on or by 14 07 1915 a platoon from the company was attached to the newly formed 369 Infanterie-Regiment. As SS agreed elsewhere - http://1914-1918.invisionzone.com/forums/index.php?showtopic=208251 post 16 - although “The regulations stated how things should be marked, with the formats showing details for the use of armourers. Of course not every marking is per regulations”. And this scabbard is a nice case that seems to prove the rule! As I understand it (and am happy to be corrected), the 1909 regulations specify that an Armee Korps should use Roman numerals to indicate which one it was. 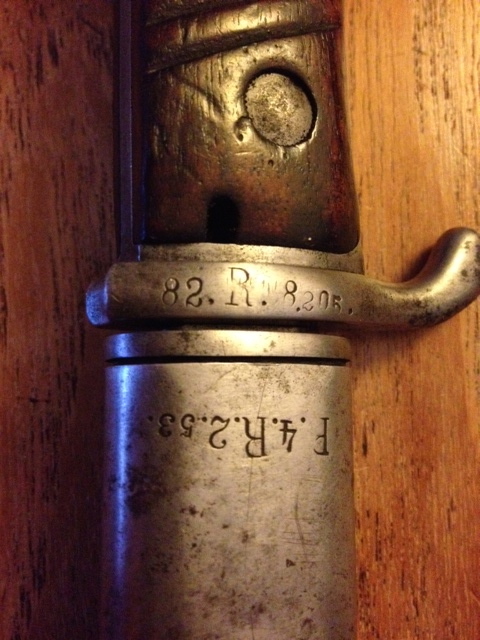 But this scabbard of Orcutt's, reading '1.E.M.G.K.7.A.K.36', and Carter’s recorded bayonet marking reading ‘’1.E.M.G.K.16. A.K. 99, which he interprets as the 1.Ersatz-Maschinengewehr-Kompagnie (des) XVI Armee Korps Waffe 99, is yet another example of - shall we say? - an official marking that shows how regulations regarding these were NOT always followed to the last letter 't' and 'i'. Thats quite the marking! I'm sure I've probably missed something here (working 9am to 11pm every day is making me forgetful) - but where are you researching these markings? I bought the Roy Williams (vol 1) book you recommended and whilst I absolutely love it - it is (as you said) more of a collection of fabulous photographs of the key german bayonets and their markings rather than an explanation of the markings. Whilst I'm here I thought I would post a shot of another s98 in my collection which has a slightly more straightforward marking, although interestingly this one is unit marked to the 119th (1st Wurttemberg) Grenadiers - part of the XIII (Royal Wurttemberg) Corps. 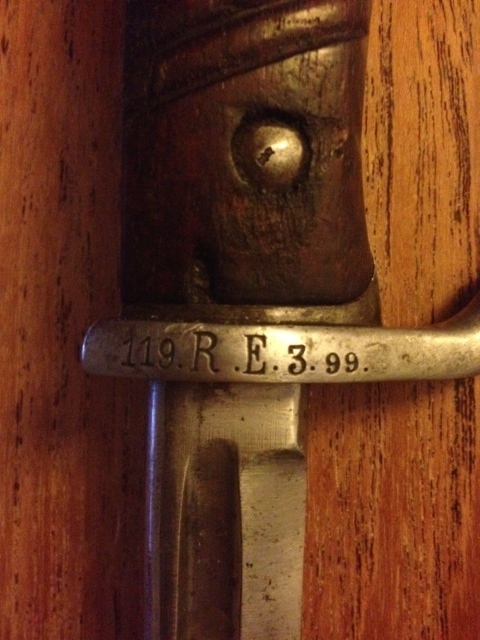 I'm yet to research this marking and the history of the regiment but assume that "RE" refers to an ersatz battalion of the 119 regiment. Anyway I'll pop up more information once I had a moment to look into this a little further. A quick search revealed the following page on the IR No.119 which is quite interesting (and a very well design site) - and includes a photo of men of the IR No.119 in May 1915. Several of the men appear to be holding bayonets which may be s98s. Yes, my one compliant about Roy's book is the lack of explanation of the markings although he does give a summary list at the end of volume 2. Walter's German Bayonets has some of these unit abbreviations also, but the Carter volumes are by far the best for explaining them in detail. I use all of these, but the main sources are the Prussian regulations of 1877 and 1909 about weapon marking, and I have managed to get copies of both, but have not yet sat down to translate them. They indicate how the markings should be done, but there are a host of markings that don't fit in with the official marking system - evidently, this went somewhat by the rails when WWI came along! In fact my copy of the 1909 regulations, which was originally issued in January 1909, incorporates supplements issued in November 1909, May and December 1910, and April 1911. I cannot help but think there is/was one or more issued after that last one, to incorporate 'new' units such as 'Flieger', but I have never seen or heard of an example(s) . PS: That's a long day you have! I thought mine was bad enough with having to deal with the boys and their breakfast after getting up, then work, and then picking the boys up from school and dealing with them until dinner time followed an hour or so later by bed time stories! My wife also works a long day, so I do this in return for a 'free' weekend! You are spot on the ball with that one! Carter volume 2 lists other known examples (to him) of Wurttemburg S.98's, but has only the 120, 121, 122, 123, 124, and 125 Regiments, and only one for a Ersatz Battalion - '123.R.E.4.77'. I'll try and find out more about them for you later - the 119 is one of a scant handful missing from the German site I normally use. Whilst I'm here I thought I would post a shot of another s98 in my collection ... marked to the 119th (1st Wurttemberg) Grenadiers - part of the XIII (Royal Wurttemberg) Corps. ... I'm yet to research this marking and the history of the regiment but assume that "RE" refers to an ersatz battalion of the 119 regiment. Who is the maker? Those listed by Carter for the Wurttemburgers are ERFURT, C.G.HAENEL, and P.D.LUNESCHLOSS, with ERFURT the majority, and dates of '03, '04, and '05. I should have added for the sake of completeness that Bavaria generally followed the Prussian marking system, the notable exception being the "B" at the front of the unit number - but I have never seen a copy of the Bavarian regulations. 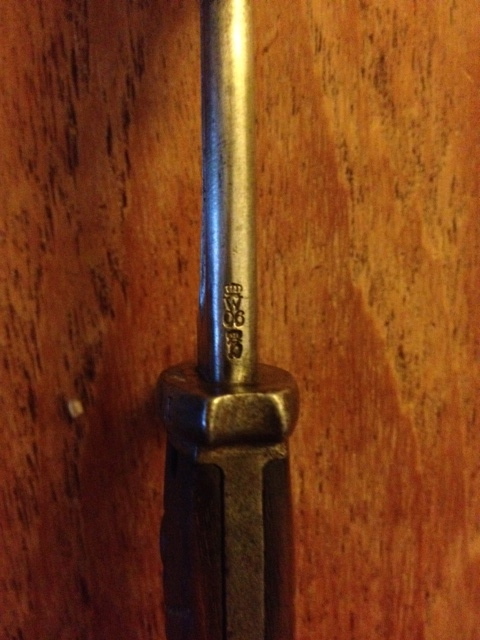 It is also important to be aware that there are other documents on weapon marking that I know of but do not have copies of, namely the Vorschrift über das Stempeln der Handwaffen, Berlin, issues for 1881, 1882, 1890, 1897, and 1910. I assume that the regulations of 1909 (as emended in April 1911) superseded all of these, but note that although my copy of the 1909 regulations incorporates four supplements, the latest being April 1911, Walter, p. 121, says that there were 'more than 30' issued between November 1909 and the April 1911 one! Very interesting, thanks Trajan. I will check date and maker tonight and let you know. A very nice site - excellent account of things from the other side of the Hawthorn Ridge Mine, and of the overall experience of the 119th on the 1st July 1916. Trajan - maker is Simpson & Co and the date is 05. A gift to me today, from my brother. Erfurt, 05. With slightly shrunken, but otherwise nice shape leather scabbard. A welcome addition, since my other 98 has a metal scabbard.